As the first individualization-information processing equipment put into practical service worldwide, Automated Fingerprint Identification System (AFIS) has always been regarded as the first choice in individualization of criminal suspects or those who died in mass disasters. By integrating data within the existing regional large-scale AFIS database, many countries are constructing an ultra large state-of-the-art AFIS (or Imperial Scale AFIS) system. Therefore, it is very important to develop a series of ten-print data quality controlling process for this system of this type, which would insure a substantial matching efficiency, as the pouring data come into this imperial scale being. As the image quality of ten-print data is closely relevant to AFIS matching proficiency, a lot of police departments have allocated huge amount of human and financial resources over this issue by carrying out manual verification works for years. Unfortunately, quality control method above is always proved to be inadequate because it is an astronomical task involved, in which it has always been problematic and less affiant for potential errors. Hence, we will implement quality control in the above procedure with supplementary-acquisition effect caused by the delay of feedback instructions sent from the human verification teams. In this article, a series of fingerprint image quality supervising techniques has been put forward, which makes it possible for computer programs to supervise the ten-print image quality in real-time and more accurate manner as substitute for traditional manual verifications. Besides its prominent advantages in the human and financial expenditures, it has also been proved to obviously improve the image quality of the AFIS ten-print database, which leads up to a dramatic improvement in the AFIS-matching accuracy as well. Automated Fingerprint Identification System (AFIS) is one of the most popular biometric databases across the globe and has now developed into the first choice for accurately identifying criminal suspects, unidentified victims, persons with cognitive disorder, and victims and the casualties in air disasters, sea disasters, earthquakes, tsunamis, and wars. After the 911 event, to cope with safety challenges and the problems of social management brought about by the rapid spread of terrorist threats and large-scale migration, all nations across the world have started the research over projects of Imperial Scale AFIS (ISA), in which all kinds of previously stored data in different fingerprint databases have been integrated and put into practical use, with the aim of providing faster, more accurate system to protecting civil rights, and serving social and economic development. AFIS' construction and application in China Police was started by the Forensic Science Division since the 1990s. Through more a decade of development, over thirty provinces, autonomous regions and municipalities have separately formed their local four-layer AFIS networks (from the Provincial Police, Municipal Police, County Police, to front-line law enforcement layer) and tens of millions of ten-print records has been put into these databases. Furthermore, based on the networks above, practical applications such as “latent to ten-print match,” “ten-print to latent match,” “latent to latent match,” “ten-print to ten-print match,” and “fugitive fingerprint tracking” have also been carried out with eminent crime-solving efficiency and features of fast response and accurate suspect targeting. Moreover, what is more, in recent years, alike the Western countries, China's Entry-Exit Administration and Civil Administration have also put forward “Electronic Passport Fingerprint Registration” and also “National Identification Card Fingerprint Registration” policy to solve the social management problems caused by the economic globalization, rural urbanization, and rapid expanding flowing population. In the “Big Data” era, as important elements of fingerprinting resources, data taken from the above mechanisms may provide broader and actively updating information for the ISA Database with distinctive features of China Police application. Moreover, if this precious information could be integrated within a heterogeneous ISA Database and applied for a series of cross-region and cross-division applications, Police Services would sure benefit from the convenience and efficiency of this new solution that is based on the Big Data applications. Based on research of the above heterogeneous ISA, the authors have put forward an integrate acquisition quality control platform that runs independently from the existing AFIS with models of integrating fingerprint data-sharing and cross-structure and cross-layer data auditing. Moreover, this has greatly increased the quality of fingerprint image database, assured the standardization of demographic information, and provided an effective tool for Fingerprint Administrators to uniquely supervise the operating status of fingerprint collection equipment (in all subsidiary police divisions), all subdatabases (even their relevant data submission loading rate), and the data flow in all application levels, which has remarkably improved the standardized management and case solving efficiency of AFIS. In China, the task of fingerprint collection involves primary work by 15 Police Jurisdictions ranging from Law Enforcement to Administrative Services. Due to the facts of large coverage of working business, wide distribution of collection points, great numbers of police staff, and their varied operating proficiency, the quality of fingerprint collection has not been guaranteed for a long time. The quality of image data in fingerprint collection is a key factor influencing the efficiency of AFIS. Entry of large numbers of incomplete fingerprint images, fingerprint images with core deviation, fingerprint with unclear ridges, and fingerprint with poor minutia into the database will lower hitting rate and increase the difficulty of manual verification, or even worse, increase the probability of mistakes in comparison. What is more, the existence of low-quality data will attenuate the system response and prolong user's waiting time, which will consequently affect the user's initiative of fingerprint comparisons. To improve the quality, large numbers of human resources are required by the commonly used manual method. Domestically and internationally, to make it in time, fingerprint experts have to build several quality control teams and work long hours to assure the quality of all the data (which are transmitted from thousands of subordinate law enforcement agencies, 24-h a day) be manually checked with naked eye. As a result, sample quality control is generally utilized in most regions in China and other countries; moreover, this method is not comprehensive or timely, leading many frontline law enforcements to lose the opportunities of recollecting better records. In the light of Chinese cross-region migration, with the rapidly expanding requirement of fingerprint individualization, if the traditional quality control method is adopted as usual, the quality checking time will be prolonged greatly by the increasing of data and collection points, and the data quality also will not be guaranteed. Hence, that is why we are in urgent need to facilitate the new infrastructure to minimize human deficiency and dramatically improve the data quality and matching performance of the AFIS system. At present, law enforcement of different specific department (within China Police) does not have universal fingerprint collection standards (1) or unified fingerprint system (2). By integrating the fingerprint image data from multi-standards and cross-structure into unified quality control and standardized data sharing protocol, our proposal is to pool all the dispersed information resource from different data systems for unified management and Big Data applications. Surveys have indicated that a majority of fingerprint database users (whether B/S or C/S structure) have the need of cross-data structure (CDS) and cross-system layer (CSL) auditing technology, especially those database administrators with complex infrastructures, who are always under background of diversity in fingerprint collection software, data processing flow, information transmission mode, and application requirements from different AFIS systems of different law enforcement-specific departments. Our proposal aims to increase the traceability and lower data lost by CDS and CSL, as well as enhance integrity of the entire Fingerprint Big Data Architecture as described in this paper. Recently, China is planning to build a unified National Criminal-Fingerprint-Database. After discussing with relevant law enforcement administrations, our team has been directed to guarantee the urgent need of evaluating quality of fingerprint data, which come from over 30 provincial AFIS databases with FPT collection standard. Some of this project technology aims to build the Quality Guarantee Network for China National Criminal. The current fingerprint collection equipment (such as live fingerprint acquisition apparatus and optical scanners) is widely distributed and broadly used, to ensure the fingerprint image quality; the universal method is a 6-year redundancy. If we can develop an algorithm to detect the malfunctioning fingerprint collection equipment, such as damaged optical components or degradations, the fingerprint image quality will be dramatically improved with much lower expenditure of hardware. In China, the law enforcement of different specific department is using AFIS systems of different programming structures, some are B/S, and the others are C/S. Up till now, domestically and internationally, there has never been unified or clarified standard on the quality evaluation of a single fingerprint. Relevant researches mainly include the following content: SO/INCITS-M1 drafted a quality standard for fingerprint samples, briefly outlined the fingerprint sample quality factors ranging from internal physical characteristics, validity rates, to effectiveness. Chen et al. have taken ridges clarity and the recognition of minutiae (bifurcation, ridge ending, etc.) as the standard of evaluating the fingerprint quality. Qi et al. have proposed seven minutiae elements, analyzed the influence of every element on the quality scores, and then locally and global evaluated the quality of fingerprints. When making a standard for Fingerprint Identification System, National Institute of Standards and Technology (NIST) has also provided several elements and initial evaluation concepts of fingerprint image quality in published version “fingerprint image quality” (NISTR7151, 2004), but without detailed method or criteria. Currently, most scholars have adopted the NIST concepts of fingerprint quality evaluation. When processing fingerprint images, on the one hand, researchers will take the gray value expectation and variance of image as substitutes of ridge contrast and ridge clarity; on the other hand, they will estimate the oriental consistency of fingerprint ridges by the image filtering algorithms. The current fingerprint quality evaluation focuses mainly on the image quality rather than considering whether the image quality can contribute to the higher hitting rate. The author has chosen those image quality elements which contribute to the higher hit rate, by which the AFIS-matching algorithm can accurately distinguish the target fingerprint with similar images (database scale ranging from 10 × 7 to over 10 × 8 records), and diminish the attenuation phenomenon in hitting rate. Besides, fingerprints are collected out of different requirements, so the collection image areas differ from the specific law enforcement departments. Moreover, in the standard fingerprinting, the region of fingertips is always omitted, and in-plane fingerprinting collection, the left delta and right delta regions are always omitted. Referring to the above heterogeneous images, a single evaluation method cannot be utilized to give an accurate judgment. Hence, for the perspective of higher hitting efficiency, we must analyze the image quality of above heterogeneous fingerprint images of different scale of collection areas, and we need to take the following three factors into account: (1) image quality of a single fingerprint; (2) high-quality minutiae number of each fingerprint; (3) a functional fingerprint or not. Considering the close interaction among above three factors, while evaluating fingerprint quality, all the three factors should be analyzed carefully rather than just a single one. The higher quality of a single fingerprint image is, the number of high-quality minutiae will be; thus, a higher hitting accuracy will be obtained by commonly used AFIS algorithm. Meanwhile, on crime scene, latent fingerprints from the functional fingers (thumb, index, and middle fingers) are more frequently collected than those from the ring and little fingers, so when evaluating the ten-print quality, the functional fingerprints are expected to contribute a higher weight coefficient. As the above factors belong to different quality evaluation dimensions (or commonly speaking criteria), when evaluating ten-print quality, an integrated fingerprint quality evaluation method (IFQEM) should be adopted rather than a simple weighed average. IFQEM is an integrated evaluation methodology for multi-evaluation, in which multi-elements and indexes are selected, and to transform the evaluating elements and indexes into the results that reflect the integrate characteristics of evaluation object. In this method, the evaluation indexes chosen and their relevant weighed average will dramatically influence the integrate evaluation results. When this is applied to fingerprint quality evaluation, lots of mathematics techniques, such as rank sum ratio (RSR), TOPSIS, and entropy, can always be utilized. Usually, the declining fingerprint quality results from two major reasons; one is the damage or degradation in optical componentry of collection equipment, the other is the misoperation of the users. This paper has put forward a method that assesses the reasons leading to these declines in quality at an estimate performance with a reliability of 95%. In this paper, a systematic algorithm of fingerprint images quality measure is applied, which was firstly presented by our team in LNCS 6839, 2012. 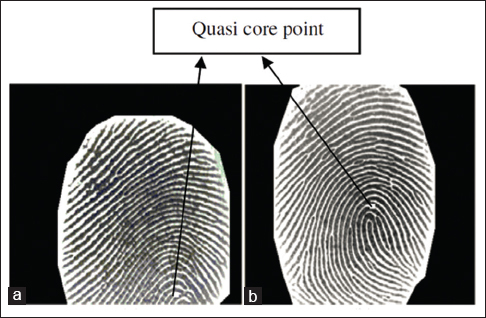 This method comprehensively evaluates the quality of fingerprint images in several elements, such as size of the fingerprinting area, contrast of fingerprint image, core position, and clarity of ridge-groove structure. The algorithm estimates the quality of each element with a score and gives a final score on the integrate quality of the fingerprint. Contrast of fingerprint is a basic element of quality since the ridges will be blurry when the finger is too dry or wet [Figure 1]. It can be denoted by gray mean and gray variance: An image printed by dry fingerprint is usually with high gray mean and low gray variance, while a wet one is always with low gray mean and low gray variance. At present, most of matching algorithms are based on minutiae. As minutiae are always distributed around the singularity points areas (the areas abound core or delta), the image quality of those areas is of key importance of a single fingerprint image quality (some problems arise from the arch without an explicit singularity). When the fingerprint image is collected for the further applications of matching or comparison, an accurate location of the singularity point is of extreme importance for the relevant AFIS algorithms (such as extracting algorithm of minutiae, core, and delta and matching algorithm). As a continuous study of previous research, this paper has applied the quasi-core point as a substitute of the true core point [Figure 2]. When the fingerprint image is collected merely for registration purposes (such as Electronic Passport Fingerprint Registration and National Identification Card Fingerprint Registration), any area with adequate stable minutiae is suitable to be collected. Fingerprint samples from Fingerprint Verification Competition (FVC) Database FVC2000 and FVC2002 were randomly selected to validate this proposed method. Experiments have shown that the higher quality the image, the higher hitting probability will be. RSR  is a broadly applied statistical analyzing method in quantitative analysis. The basic principle of RSR is to obtain the nondimensional statistical value by rank transformation in a matrix (with n row and m columns, n refers to the number of objects being evacuated, m refers to the number of evaluation factors or evaluation ranges), and priorities of the objects are ranked by the RSR value, which is analyzed by the segmentation method (when compared groups are large) or the confidence interval method (when compared groups are small). This method has been broadly used in medical field for multi-factors integrate evaluation, statistical prediction and forecast, and statistical quality control. In this paper, RSR is based on the ranking of “single fingerprint image quality,” “number of minutiae,” and “whether a functional fingerprint or not.” The image quality value of single fingerprint is usually given by scores ranging from 1 to 99, the number of fingerprint minutiae is always ranging from 1 to 180, and the ranking value of functional fingerprints is also granted with numbers (functional fingerprints as 2, nonfunctional fingerprints as 1); thus, a nondimensional statistical value of RSR is obtained after the ranking transformation. As for the “n” fingerprints taken from different finger positions, with the above three quality factors, an original data table of n × 3 could be established to form an overall matrix of Any randomly selected matrix element is marked as Rij, representing the rank value with the factor j of the fingerprint i. The integrate quality value of the single fingerprint image could be calculated from the formula of in which i = 1, 2…n. As distribution of RSR has not been hypothesized, it is possible to turn RSR into an approximately normal distribution by probit calculation. Moreover, by taking the probit value relating to accumulated frequency as the independent variable, and the RSR value as the dependent variable, a linear regression equation could be established as: . The aim of this calculation is to remove the random noise in RSR (by using approximate normal distribution curve) and to guarantee the accuracy of the revised value of RSRfit-i. 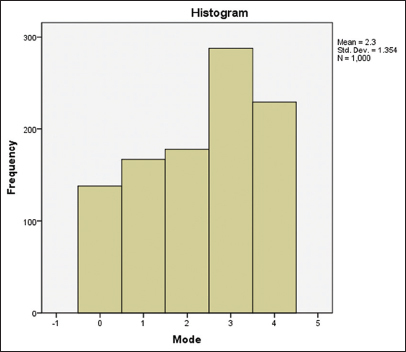 Quality scores based on the above method are named as Si, and We have formed an Integrate Quality Evaluation (based on one individual's different “n” finger positions) with a formula of . And finally, several transformation strategies have also be applied to transform these original evaluation scores into the generally-used score mode (with a score range of 1 to 99). The following flowchart can be used to summarize the method of fingerprint quality evaluation based on RSR [Figure 3]. To verify whether the RSR method is applicable in real-time automatic quality evaluation of single fingerprint image, 1000 single fingerprint image samples have been randomly chosen from AFIS database for comparison of the manual quality evaluation data and RSR quality scores given by the above algorithm. As manual verification is incapable of providing some certain scores, the fingerprint experts were told to give their quality verification based on a five-grade model: excellent, good, acceptable, weak, and unqualified. To guarantee the quality of manual evaluation, ten fingerprint experts with more than 5 years working experience from Benxi, Dalian, Panjin, and Shenyang have been introduced to evaluate, respectively, the same 1000 sample images to give a comparatively accurate evaluation result. 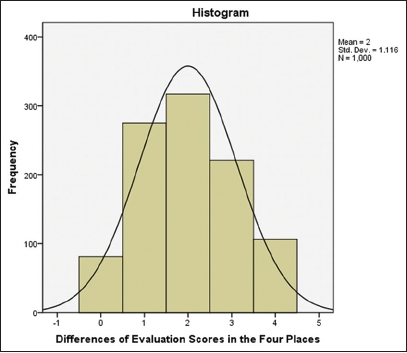 [Figure 4] is a histogram showing the deviations in quality evaluations given by different experts, and they hold different opinions about the same fingerprint samples (mostly within a quality deviation of 1–2 grade). As the deviations shown in the histogram conform to approximate normal distribution, the quality evaluation from experts is credible and applicable. Furthermore, after removing the abnormal manual-evaluated data through statistical methods, a new distribution curve (as shown by [Figure 5], coded as 4: excellent; 3: good; 2: acceptable; 1: weak; 0: unqualified) of manual evaluation is formed with mode index method (with records without mode data, use median as substitute). 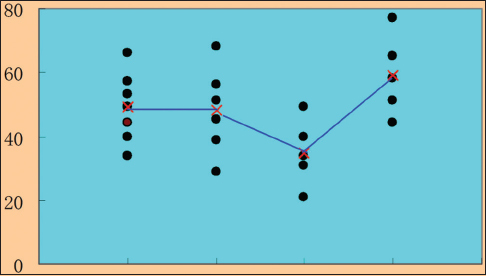 The results of the evaluation can be the grading criteria for the evaluation scores given by the algorithm proposed in this paper. One thousand image samples were evaluated with the method proposed in this paper, and after removing the abnormal data, the result is compared with manual evaluation result; thus, [Table 1] is formed. As is illustrated [Table 1], the score–range width varies among different manual evaluation grades. Moreover, this conforms to a normal pattern within the sensory evaluation field. As collection equipment plays a significant role in fingerprint quality, an algorithm based on analysis of variance (ANOVA) has been developed for analyzing the fingerprint quality distribution among the collection equipment, by which damaged optical components or degradation could be targeted accurately. [Figure 6] has shown the diversity of RSR average values of ten-prints collected by different equipment in four random collecting units. Because the distribution of individuals with various dermatoglyphic conditions is supposed to be normal distribution in each collecting unit, when the RSR average value of a certain collecting equipment is dramatically lower than the others, there must be some problems existing, either in equipment or in operation. With the method of ANOVA (quantitative analysis), deviations of RSR average values could be judged as random errors or systematic errors. If this deviation is large enough to be a small probability event, then it can be preliminarily inferred that there must be something wrong in this collecting point, either in equipment or in operation. Therefore, with the multiple comparison methods of least significant difference and Duncan (Duncan's multiple range test), fingerprint-collecting equipment of large deviation in RSR average values could be conveniently targeted by the fingerprint administrations. Based on the same principle, because the distribution of individuals with various dermatoglyphic conditions is supposed to be normal distribution for each collector with the same police unit, as long as one of the collectors could make a normal RSR average value, the quality problems could be diagnosed as misoperation of the other collectors. Moreover, this analysis can be changed to conform to other phenomena of quality control so as to achieve a higher input-output ratio of equipment investment and training resources. Detailed process is shown in [Figure 7]. During the past two decades, there have been more than a hundred of AFIS producers flourishing into China Police Industry, including famous international manufacturers from USA, Europe, and Japan. Therefore, other countries have no such diversified technology background as China Police do. In the process of this project, the following three phenomena are summarized through communications with forensic scientists in the fingerprint field. First, traditional performance ratios of AFIS products of various producers from different countries are becoming homogenous, and the differences in database capacity, comparison speed and comparison accuracy, and network application functions are no longer so unique. Second, there will still be high demand in AFIS systems for police application; however, concerns are changing from the traditional idea of “scalability and speed first” to the new concept of a combination of larger service coverage, higher data quality, and better processing control. Third, AFIS industry is probably embracing an era when Police and Civil AFIS system are developing side by side across the world. Taking China, for example, after the enactment of relevant laws and regulations concerning Electronic Passport Fingerprint Registration and National Identification Card Fingerprint Registration, more and more far-sighted scholars are appealing for legislation of fingerprint applications such as “Newborn Babies Fingerprint Registration,” “Public Tests Fingerprint Registration,” “Real Estate Ownership Fingerprint Registration,” and “Social Insurance Fingerprint Registration.,” Therefore, considering the development of first- and second-generation AFIS, it is becoming commonsense that the new generation of super-scale heterogeneous AFIS is being incubated in following 5 or 10 years. For both police and civil applications, this new AFIS is based on the big data concept and mainly features in cross-standard data sharing technology, high-quality control technology, and integrate auditing technology with accurate data traceability. Moreover, our project is expected to provide professional inspiration and orientation for an accelerated development of this transformation. We gratefully acknowledge the support of the Swiss National Science Foundation through Grant No. IZ32Z0_168366 and the University of Lausanne and the support of the Collaborative Innovation Center of Judicial Civilization, China. The authors gratefully acknowledge the support of the Swiss National Science Foundation (through grant No. IZ32Z0_168366) and the University of Lausanne, and the support of the Collaborative Innovation Center of Judicial Civilization, China. And the authors also gratefully acknowledge the support of Liaoning Provincial Police Key Scientific Research Project (through grant No.2016LNKJJH01) and China Ministry of Public Safety Key Scientific Research Project (through grant No.2016JSYJA01). Wei W, Xiaomei Z. Guidance for fingerprint information services. Beijing: The People's Publishing House; 2012. Yingwei W, Zhong S, Xiaobo T. Development and application of AFIS technologies. Police Technol 2009;2009:4-7. INCITS Biometric Sample Quality Standard Draft, M1/06–0948. 2006. Available from: http://www.incits.org/tc_home/m1htm/2006docs/m1060948.pdf. Chen Y, Dass S, Jain AK. Fingerprint Quality Indices for Predicting Authentication performance. Proceedings of 5th International Conference on Audio and Video Based Biometric Person Authentication; 2005. p. 20-2. Qi J, Abdurrachim D, Li D, Hunieda H. A hybrid method for fingerprint image quality calculation. IEEE Workshop on Automatic Identification Advanced Technologies. IEEE 2005:124-9. Wu M, Zhao T, Guo T. A Systematic Algorithm for Fingerprint Image Quality Assessment. 2011 International Conference on Intelligent Computing, volume 6839 of the Lecture Notes in Computer Science series, 2011. Fengdiao T. RSR method and relevant applications. Beijing: National Publishing Company of Statistics; 1993.